Today we completed the 2015 Greek Islands Adventure tour in Amorgos, Greece. Amorgos is one of the smaller Cyclades islands and is the easternmost island in this group. 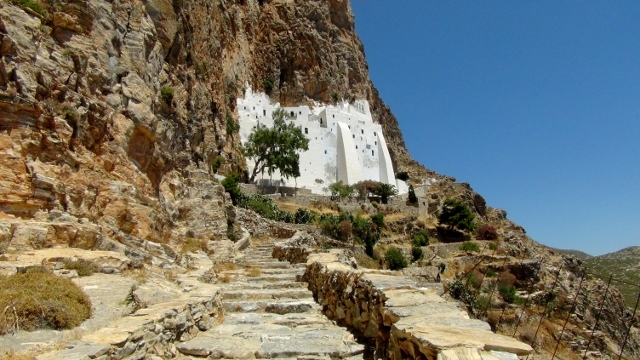 Amorgos is home to one of the most amazing monasteries in Greece, Panagia Hozoviotissa. It is a cliff side monastery northeast of Chora. It is breathtaking to see this structure overlooking the blue waters of the Aegean Sea. Today I finished in 4:42. I cannot tell you how blessed I feel that I could complete this tour at 52 years of age. Every tour has begun with inner doubts and fears, which leads to finding trust, which then forms into a faith that we can accomplish our aspirations. My body held up to the pounding, after racing the mile 5 times in 12 days in 2015. Since 2008, injury-free racing has been our theme. To have the ability and belief that I can put my toe on the starting line and feel I have an opportunity to break 5 minutes again and again. Thanks to my beautiful wife, Sekyen, and the www.OneMileRunner.com team members who help me stay physically healthy and spiritually inspired to break personal goals year after year. This was my final multiple-race tour. 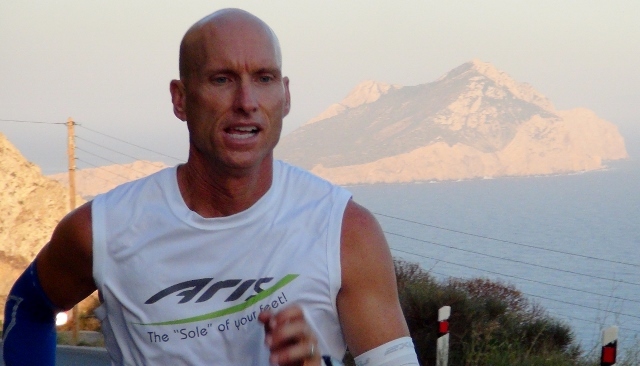 I will participate in a couple of road mile races that I have not attended before in the US and Canada in 2016. We have done an incredible amount of mile racing since 2008. Now after six months of training, we will travel to Austria, Czechoslovakia, and Germany for a little rest before heading back to the States. Thank you all for your support and encouragement during all our races throughout the years. Posted in - My Daily Journal, Author - David O'Meara, Events. Thanks for your support Barb! Never a doubt you could do this, David. You are an amazing athlete. You have worked so very hard over the years. Truly an amazing experience you and Sekyen have gone through together.